Soccer, the most popular sport in the world, poses specific nutrition challenges to optimize performance. 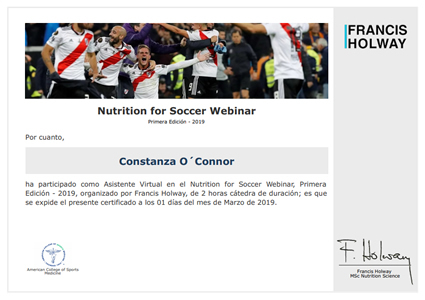 This webinar is presented by Francis Holway, one of the most influential experts in Sports Nutrition in the world, who has worked 12 years with the River Plate professional squad in Argentina, as well as the Boca Juniors youth divisions, and carried out consultation work for teams as far away as Japan. Francis has served as advisor to the International Olympic Committee, as well as those of the United States, Sweden and Qatar. He has several peer-reviewed publications in Sports Nutrition and Kinanthropometry, and bridges scientific research with on-field practical experience. In a live conference you will cover the energy and fuel demands of soccer, learn how to assess and optimize body composition for each field position, and to individualize hydration strategies. You will also be made aware of the nutritional myths and fallacies that infiltrate the soccer environment, and the all-important social skills needed to survive in a team setting. Lastly, you will cover important tips and suggestions regarding menu planning, as well as individual and group approaches to supplements and ergogenic aids that might help or even hinder soccer performance. This certificate specifies that a student has attended this webinar. The following data are included: names and surnames, name of the webinar, number of hours and name of the organization that certifies.